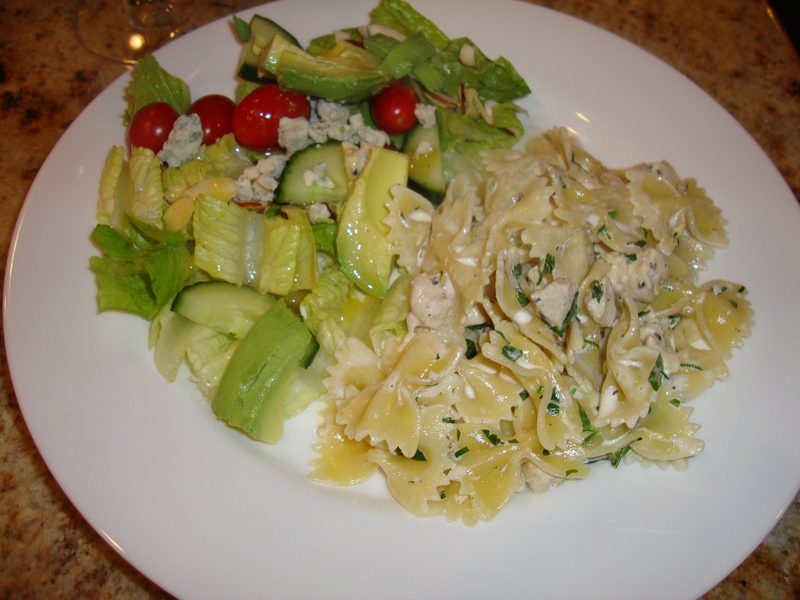 I loooove pasta salads…that is, as long as they are mayo-free. 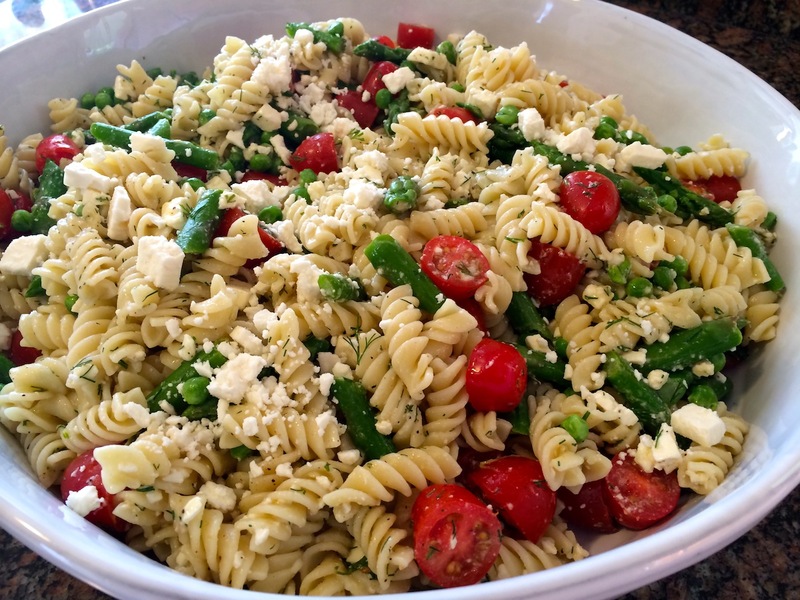 I’ve made many versions over the years (one of my favorites is Cold Pasta Salad with Roasted Chicken, Plums, Blue Cheese and Basil) and what I love about them is their versatility. You can throw in basically any ingredient, and they’re always ready to serve, no heating needed. It’s the perfect summer food. I took this Neelys recipe camping for my BFF’s birthday a few weekends ago. We went to our favorite spot up in the mountains — the last stretch to get there is a 30-minute off-road adventure, which keeps away the crowds — and we basically had the place to ourselves. 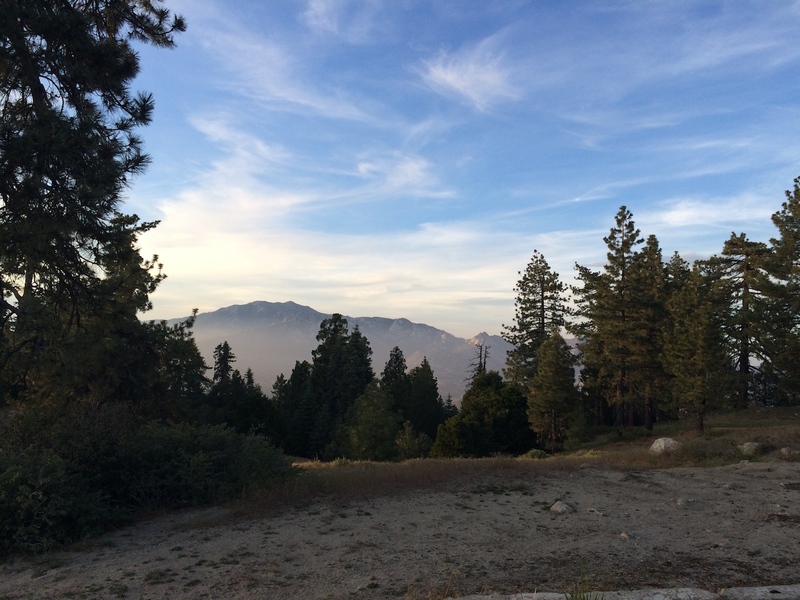 The first night we had some leftover remnants of smoke from the fires in Southern California, but the next day it blew off and we enjoyed the views of the Santa Rosa and San Jacinto Mountains. Gorg! And real pine trees in California! Now that’s camping. 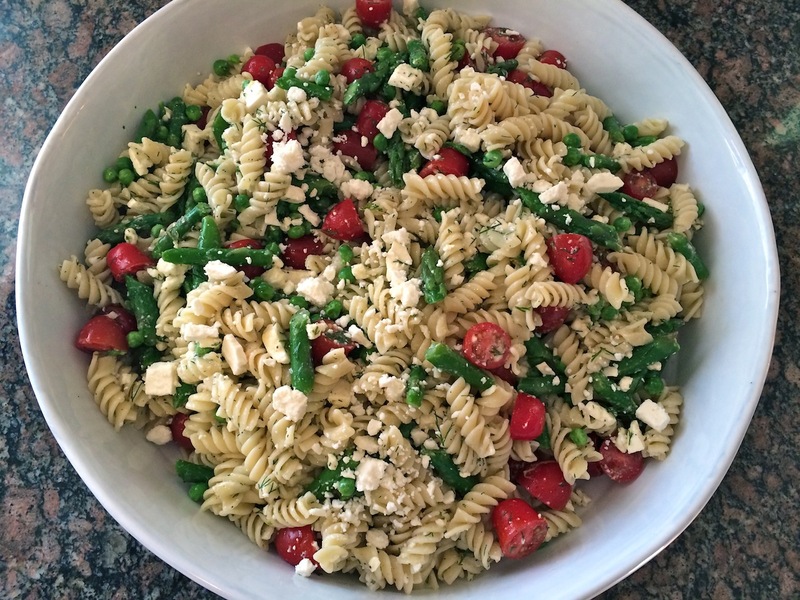 Back to the food — this pasta salad gets dressed up with asparagus, peas, cherry tomatoes, feta, dill and a lemony dressing. It’s the perfect side dish for a cookout. Throw some in a Tupperware and put it in the cooler for a camping trip. 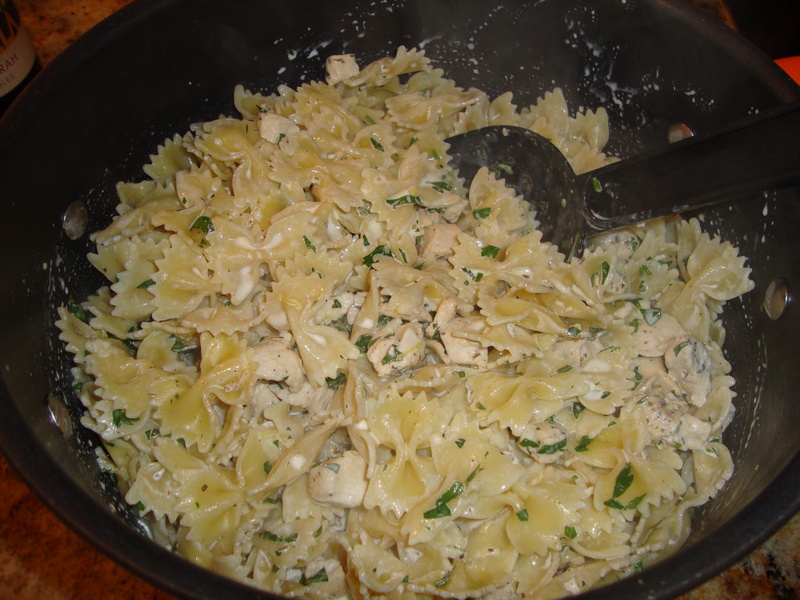 Whip some up this weekend! 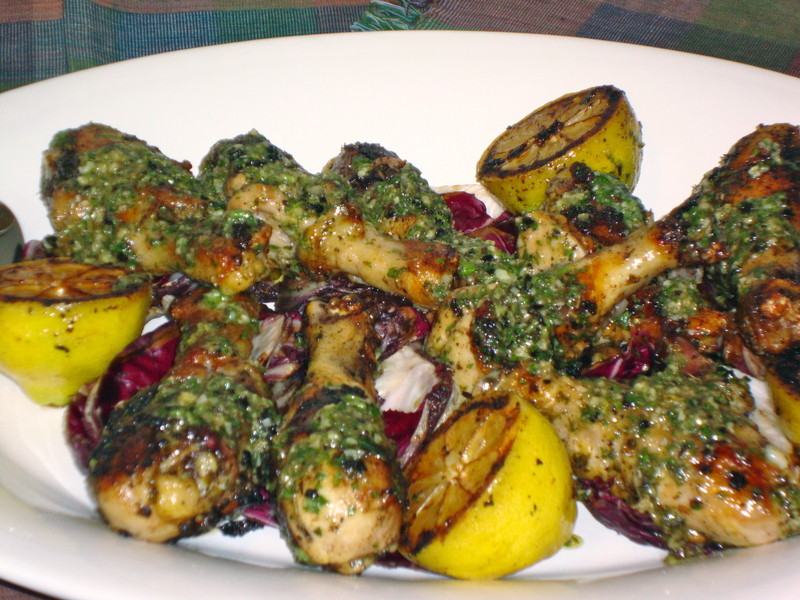 Next time I might change up the dill and add flat leaf parsley instead, for a fresher, brighter twist. 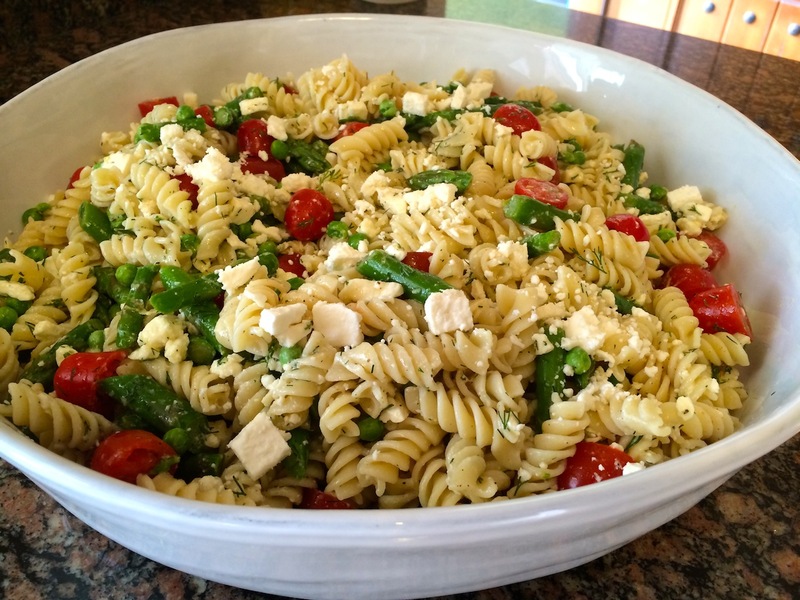 You could also switch up the feta with mozzarella or crumbled goat cheese. Make sure you salt the pasta water — and taste for salt before you serve. I underseasoned mine. 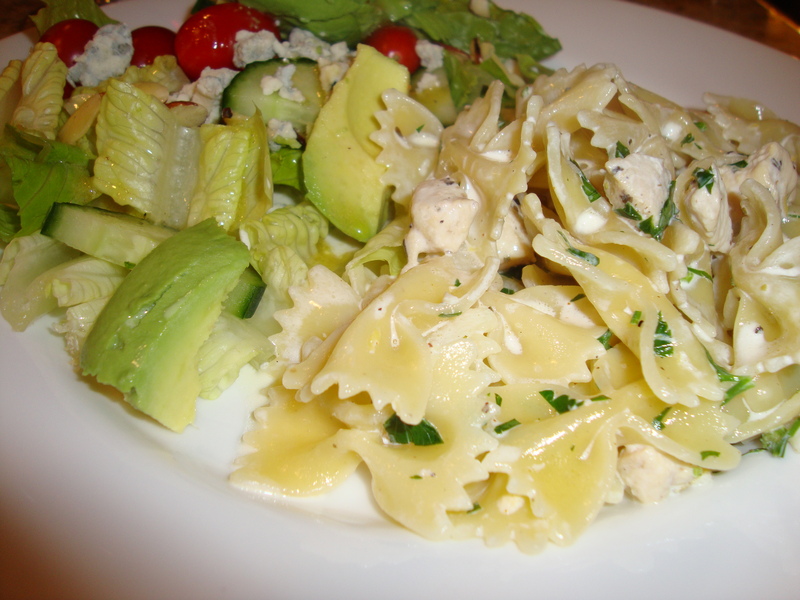 If you want a nice, simple dinner with super fresh flavors, this one’s got it. 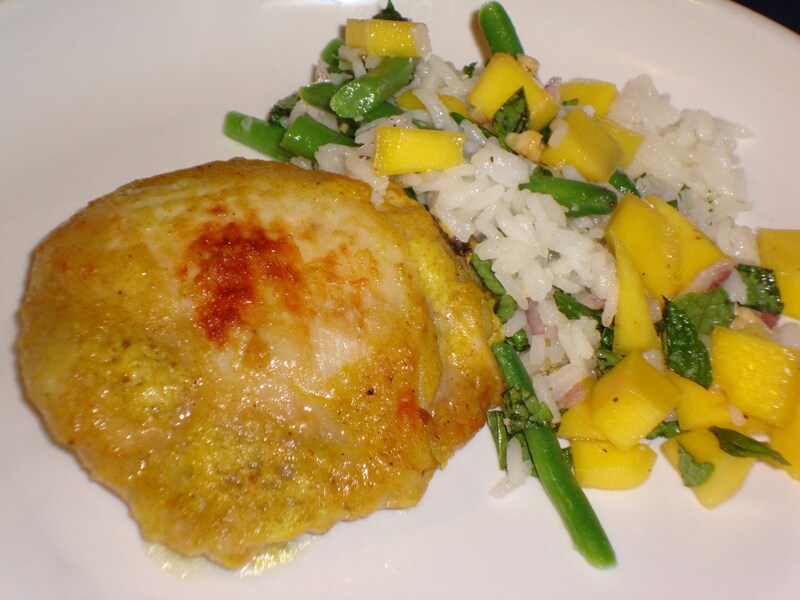 From Tyler Florence: Lemon Curry Chicken with Mango-Basmati Rice Salad. The chicken is easy — just marinated with curry and lemon and simply roasted so the skin crisps up and the meat stays nice and juicy. And this rice — wow. 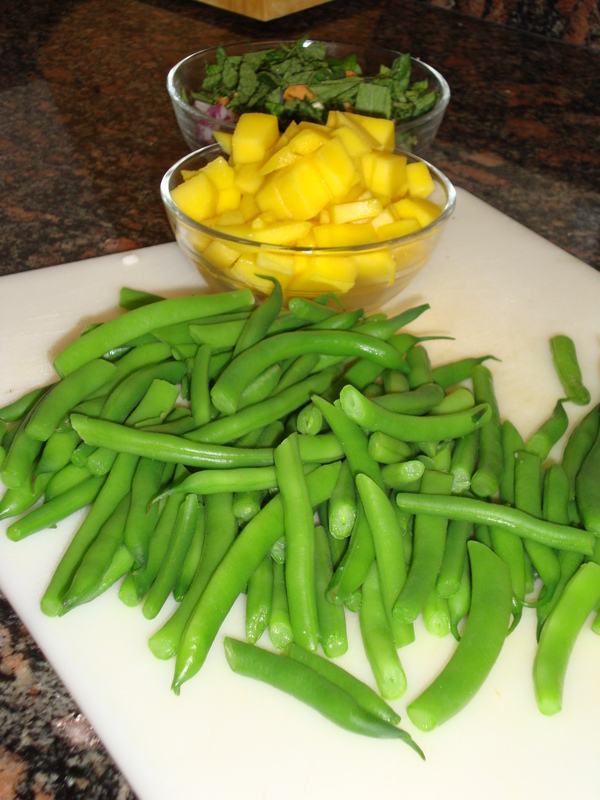 It’s got such great flavors going with the just-crisp-enough green beans, sweet, ripe mango, crunchy cashews and fresh mint, topped with a splash of olive oil, lemon juice and fresh cracked pepper — amazing. I had a bunch of chicken thighs on hand so I used just thighs instead of a whole chicken. It worked great! The fresh mint here makes a huge difference. Don’t skip it. I cut back on the red onion — I used about half of what was called for, and it was plenty. I used jasmine rice — and it was delish. And I skipped the “spread the rice out to let it cool” part. I just mixed everything together. Bam. Simple. Easy. What’s not to like? Preheat oven to 400°F. Stir together the yogurt, curry powder, lemon zest and juice, sesame oil, and salt and pepper is a big bowl. 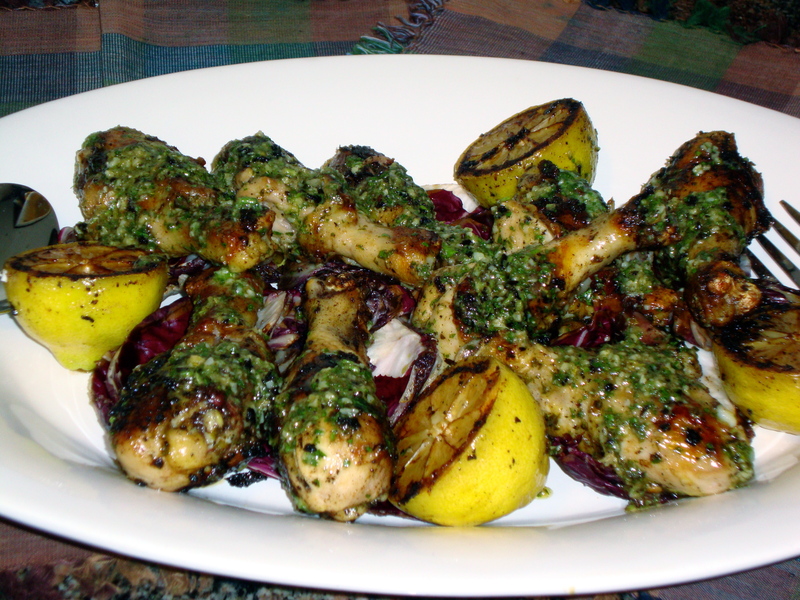 Add the chicken and toss gently to coat with the yogurt marinade. Put the chicken on a baking sheet and roast, using the remaining marinade to baste twice as it cooks, until chicken is tender and cooked through, about 45 minutes total. 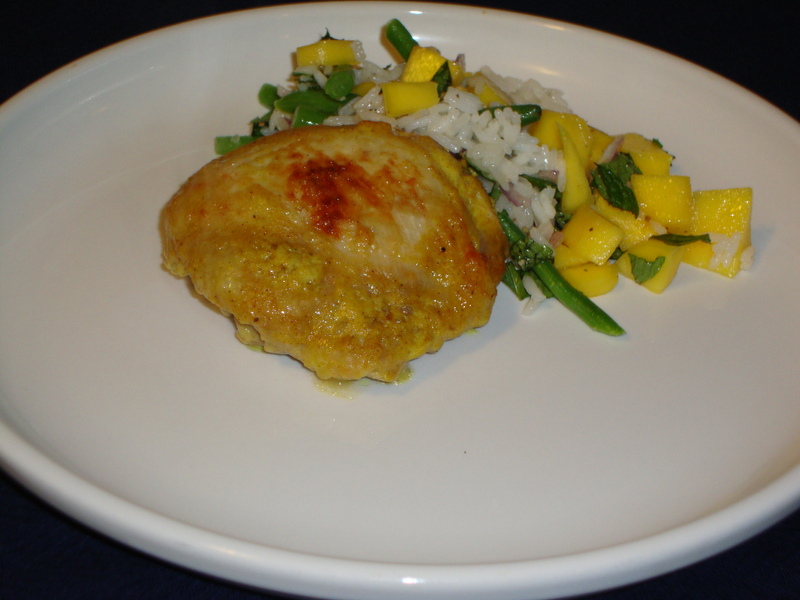 While the chicken cooks, make the rice salad. 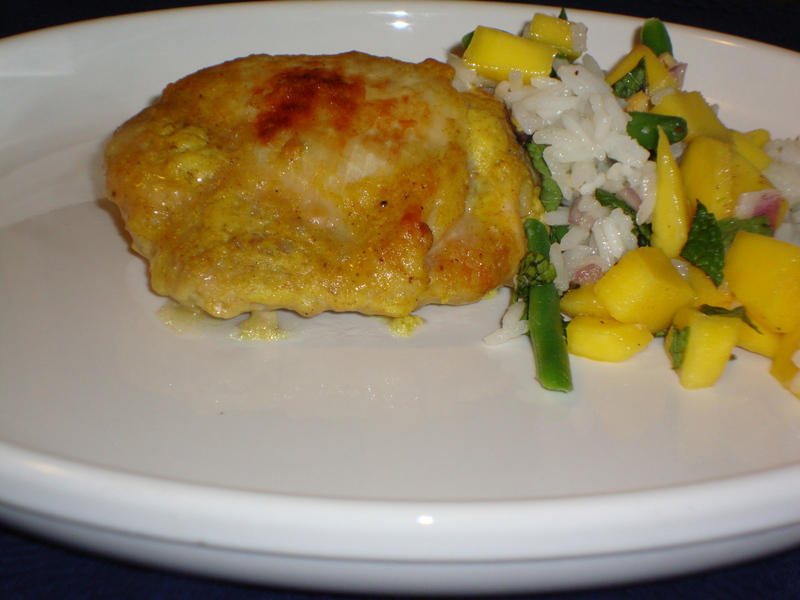 Put the rice in a saucepan with the ginger, 2 cups of water, and 1 ½ tsp. salt and bring to a simmer over medium heat. Give the rice a stir, turn the heat down to low, cover, and cook for 12 minutes without lifting the lid. 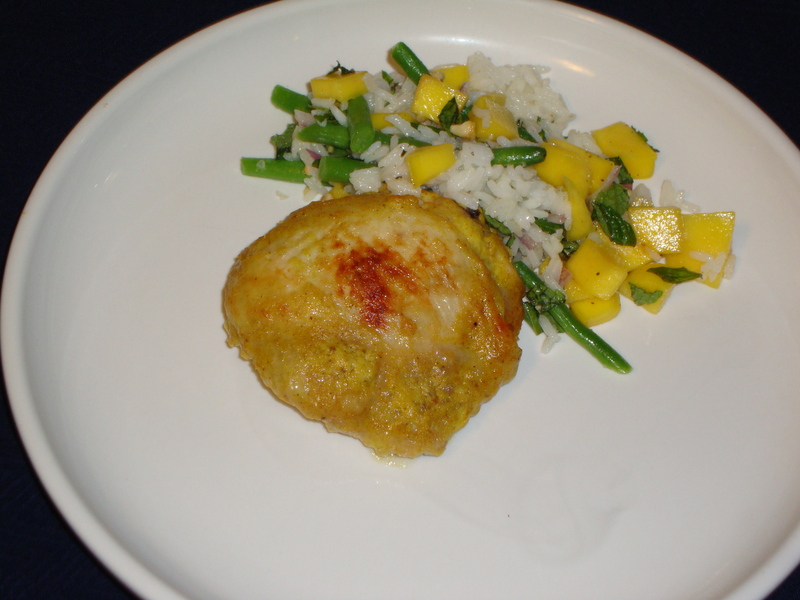 Spread the cooked rice out on a baking sheet and let it cool to room temperature. Discard the ginger. Bring a large pot of salted water to a boil for the beans. Fill a large bowl with ice water and add enough salt to make it taste lightly salted. Add the beans to the boiling water and cook until just tender, about 3 minutes. Drain, then refresh in the ice water bath to keep the bright green color, and drain well again. Cut the beans in half crosswise on the diagonal. 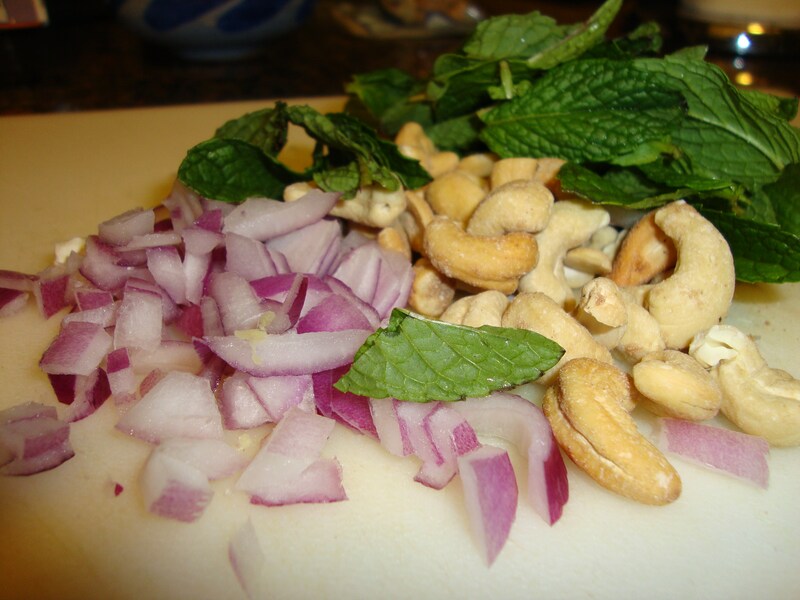 Put the onion half, cashews and mint on a cutting board and coarsely chop them all up. 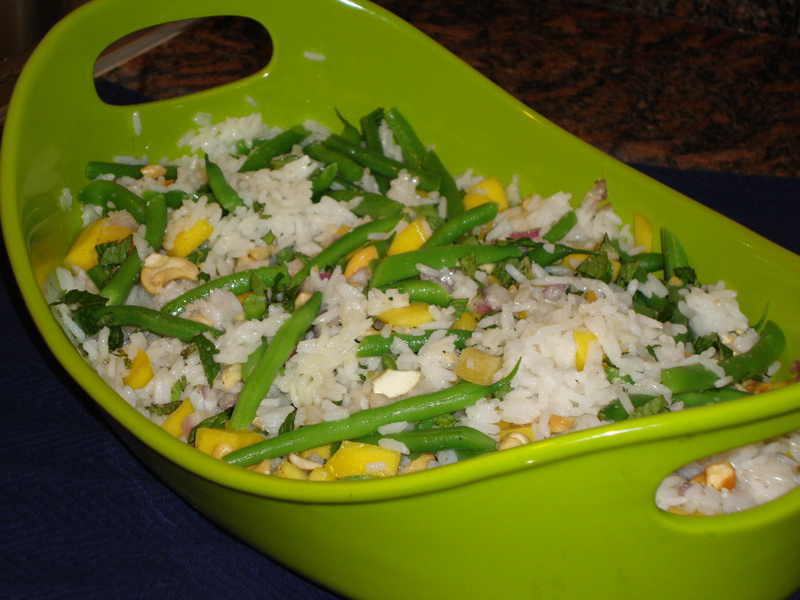 Combine the rice and green beans in a big bowl and add the chopped onion mixture. 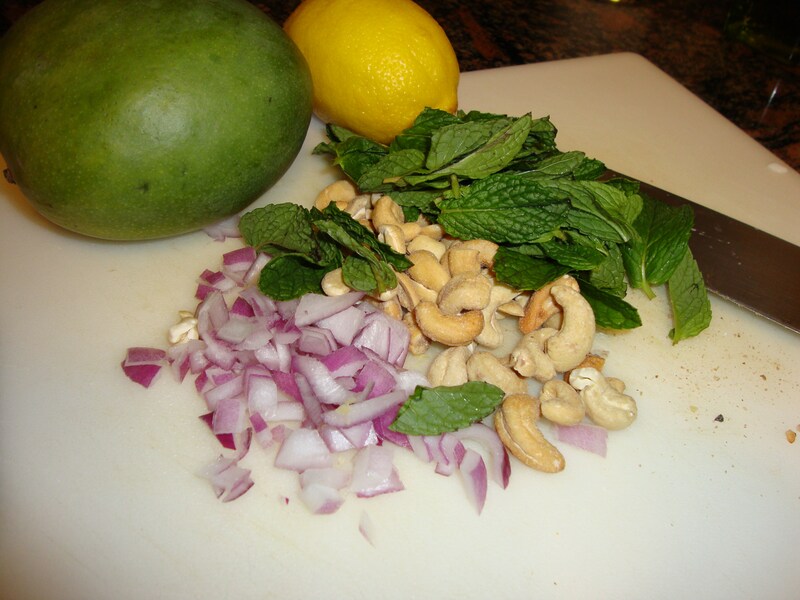 Add the chopped mango, olive oil and lemon juice and toss gently. Taste for seasoning. 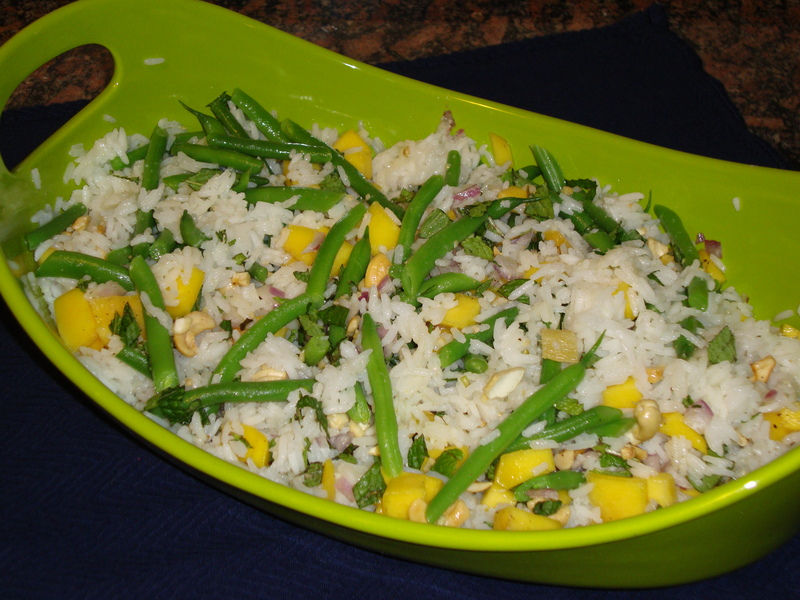 Mound the rice salad on a platter. Arrange the chicken on top.